It was a great day for racing ! Many close finishes throughout the day with good starts being the key to winning. The first 2 races had a pronounced line bias favoring the pin end. The RC adjusted for that for the remainder of the races and it got pretty tight after that. A number of Stars joined in for the racing so we had 2 starts with a short and long course. It was interesting to note that even thought they had a bit of a longer windward mark with their 6 min. head start they were on a downwind run about the same time as we were. They weren’t pulling away from us. One of our Cals ( Magical ) finished ahead of 4 of the 5 Stars in the first race..
For the day, Magical was in first place followed by Pinnical and then Osiris in 3rd place. A fun time was had by all and we finished up the day with the usual apres race meeting. For the full result standings please see the Racing Page. I have just been informed that ” alga y ” is available for sale. ( C ) alga (r) y . This CAL has been a real contender for many years and has been well maintained. The interesting name and the true story … is owed to the C and the r decal on the transom falling off at some point and so the name alga y stuck . LOL . Owned and maintained by Peter Vivian from the Victoria Fleet so if you know anyone interested please make contact through our web site. 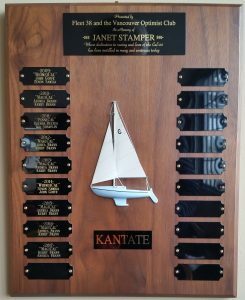 Janet Stamper Trophy – Is now mounted on the west wall of the KYC clubhouse. This is the Janet Stamper Trophy we are competing for. This is the 10th year ! I can still remember Janet’s kind encouragement & keen interest in all our members skills development in racing Cal 20’s. I feel that she has instilled so much appreciation in the hearts of many for the venerable Cal 20.